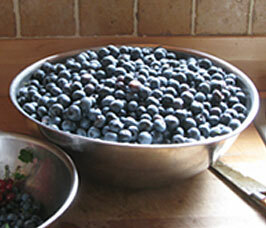 This lecture starts at the beginning, with the kinds and varieties of blueberries to order, and where to order them. We'll then move on to all-important soil preparation and ongoing soil care, planting, pruning, and harvest. A foray into bird issues ensures that you get to reap your harvest. The end result may be an overabundance, so we'll conclude with ways in which this problem is easily and happily contended with. You'll leave this lecture with everything you need to know to be picking an abundance of blueberries within just a few years. What type of “roof” supports your blueberry “gazebo”? I’ve grown blueberries for 30+years on the north end of Vancouver Island, BC Canada….with lots of success….trying to keep the birds out is another story. A temporary woven bird netting is the roof. One big piece. Some sources are http://www.raintree.com, nylon net company and others. I’ve read a few places that you mentioned using soybean meal for fertilizing the blueberries. Is this all that you do for fertilizing? Are there any worries of nutrient/micronutrient depletion? I mainly grow blueberries in containers (pine bark + peat), so the plant won’t be able to spread its roots as wide and I’m not sure if/how often I should repot or would bark/sawdust mulch + soybean be enough. If my blueberries were growing in pots filled with sand and peat, I would be concerned about lack of other nutrients besides that supplied by the soybean meal. My blueberries are in the ground so probably get all they need. The appearance and health of the plants supports this belief. If there was a concern, I would apply compost beneath the bushes. Could also do a leaf analysis to test for nutrient deficiencies. Leaf or growth symptoms indicating specific deficiencies would require quicker action, with application of those specific nutrients. Thank you, that answers my question. I’m not sure if this is the right place to ask, but what would be the best way to buy one of your books (preferrably ebook) that would benefit you the most? I love that question. Best place is from my website, under the “Books” heading. Thanks.